A family who survived the Grenfell Tower fire has said they are set to be moved out of their temporary home, as the council will no longer pay for it. 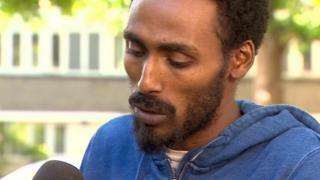 Mahad Egal and Jamie Murray and their two young children want to stay in the property, but Kensington and Chelsea Council has said it is "no longer suitable" and will not renew it. It has offered the family alternative temporary housing instead. The council says that it has not threatened anyone with eviction. The couple has previously been offered a permanent home, but declined it over fears about the use of aluminium, although the council said that all its homes for survivors were safe. The couple and their two children, aged three and five, escaped from the fourth floor of Grenfell Tower during the fire in June 2017, in which 72 people died. They moved into a permanent home last month, but within three weeks had returned to their temporary accommodation - which they first entered in August 2017. Ms Murray told the BBC's Victoria Derbyshire programme that the permanent home had been connected to a building with aluminium decorative casing around the windows. They could see this through the living room window and it made them feel unsafe following their experiences of the fire. The council said the material was not flammable and was "one of the safest forms of rain-screening building material available in the industry". But Ms Murray said: "We were given similar reassurances when we lived in Grenfell Tower. "[The council] are talking about physical safety, [but] you telling me that I am safe does not make me feel safe." Ms Murray added that the stress of their present situation had caused her to experience vomit-inducing anxiety and made her flashbacks worse. In the last two weeks she said she has also suffered a miscarriage. The family added that moving from one property to another with two children would be "stressful and unnecessary" and Mr Egal was reporting symptoms of post-traumatic stress disorder (PTSD). They said the next time they move, they want it to be their permanent "forever" home. The couple said they were now effectively being evicted from their current temporary accommodation. In a legal letter seen by the Victoria Derbyshire programme, Kensington and Chelsea Council state that it was "no longer suitable". The family now say they fear leaving the home in case they are not allowed back in. Mr Egal told the BBC that "every day from now on is a potential eviction day" and he feared the effect it would have on their children. He added that the council has paid the rent for last week and the weekend just gone, but that is it. Local Labour MP Emma Dent Coad said the council saw some Grenfell survivors as "troublesome" and wanted to "clear the decks" before the second anniversary of the tragedy on 14 June. She said there was "no culture change" at the council, and she could see no justification "at all" for wanting to move the family from their temporary accommodation. Kensington and Chelsea Council said in a statement: "We have worked with more than 180 households from Grenfell Tower to find them a suitable, permanent home. "A small number of families find they have trouble settling into their new property and if they wish to move, we will find them suitable temporary housing while they consider what they want for the long term. "All our homes for Grenfell [survivors] are safe and secure. "We have not threatened any Grenfell survivor with eviction from their property." Follow the BBC's Victoria Derbyshire programme on Facebook and Twitter - and see more of our stories here.